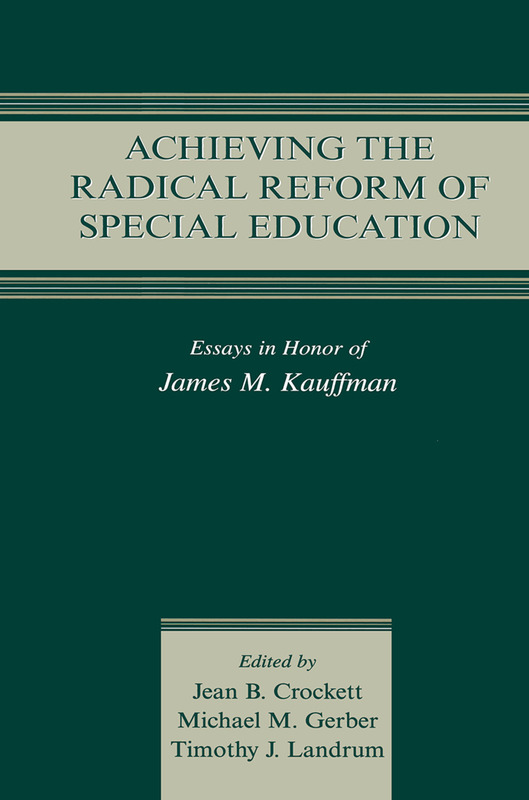 As a tribute to scholar and mentor James M. Kauffman and his prodigious influence on the education of children and youth with disabilities, Achieving the Radical Reform of Special Education highlights and examines issues central to the continued growth and maturation of the field of special education. This impressive collection features the issues Kauffman has raised pointedly and repeatedly in his writing over the past three decades. With contributions by prominent scholars, essays throughout the book provide a valuable synopsis of the status of special education and its progress toward the achievement of radical reform at the outset of the 21st century. 4) confronting problems of advocacy and reform in special education. Chapters within each section discuss the status of the field, its progress, pitfalls, and promising subsequent steps. Achieving the Radical Reform of Special Education is intended for scholars, policy makers, and graduate students in special education and associated disciplines who seek to improve schools and to improve the education of students whose behavior and exceptional learning needs prevent their academic and social development. Contents: Preface. Part I: Disaggregating Special Education Populations. Introduction to Part I. D.P. Oswald, M.J. Coutinho, On Disaggregating Disability, Whatever That Means. A.G. Boardman, S. Vaughn, Response to Intervention as a Framework for the Prevention and Identification of Learning Disabilities: Which Comes First, Identification or Intervention? H.M. Walker, J.R. Sprague, Early, Evidence-Based Intervention With School-Related Behavior Disorders: Key Issues, Continuing Challenges, and Promising Practices. T. Lewis, J. Wehby, Heeding the Call to Radically Reform Special Education for Students With Emotional/Behavioral Disorders Through Science. Part II: Repairing and Elaborating Special Education’s Conceptual Foundations. Introduction to Part II. M.P. Mostert, James Milton Kauffman: A Legacy of Special Education’s Unheralded Historical Distinctives. B. Bateman, Law and the Conceptual Foundations of Special Education Practice. N. Zigmond, Delivering Special Education Is a Two-Person Job: A Call for Unconventional Thinking. G.M. Sasso, Science and Reason in Special Education: The Legacy of Derrida and Foucault. Part III: Strengthening Special Education’s Empirical Base. Introduction to Part III. S.R. Forness, K.Y. Beard, Strengthening the Research Base in Special Education: Evidence-Based Practice and Interdisciplinary Collaboration. B.G. Cook, M. Tankersley, A Preliminary Examination to Identify the Presence of Quality Indicators in Experimental and Single-Subject Research in Special Education. K.L. Lane, S.M. Barton-Arwood, L.A. Rogers, E.J. Robertson, Literacy Interventions for Students With and At-Risk for Emotional or Behavioral Disorders: 1997 to Present. Part IV: Kauffman’s Contributions to Special Education. J.W. Lloyd, D.P. Hallahan, Advocacy and Reform of Special Education.